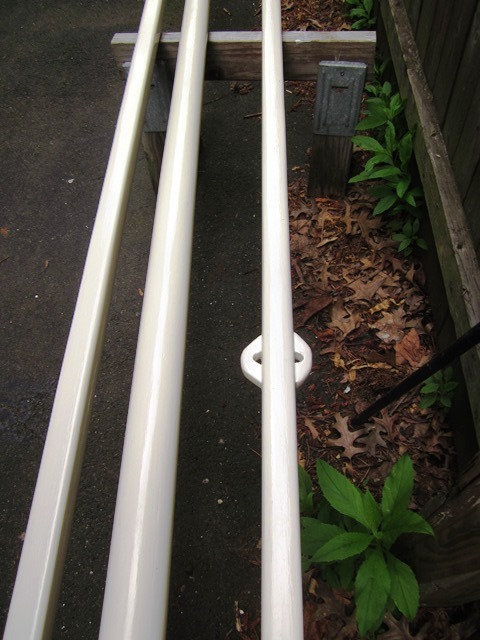 Mast partner installed with custom 1/4 x 20 threaded rod system. Tiller fashioned from 2×4 fir. 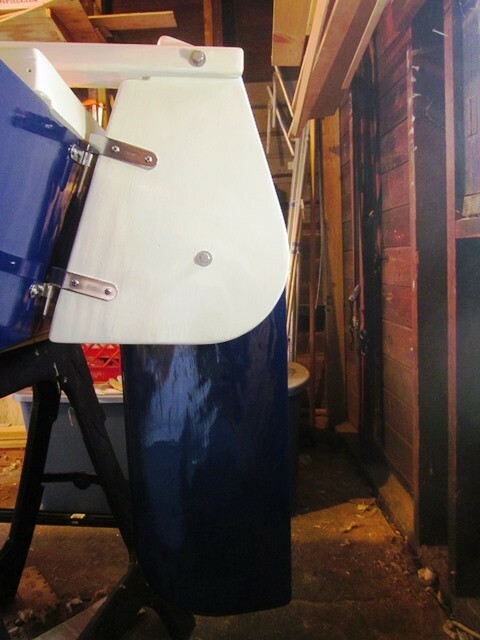 The rudder has been assembled and attached to the transom with Racelite pintles and gudgeons. Chocks have been added to the yard. 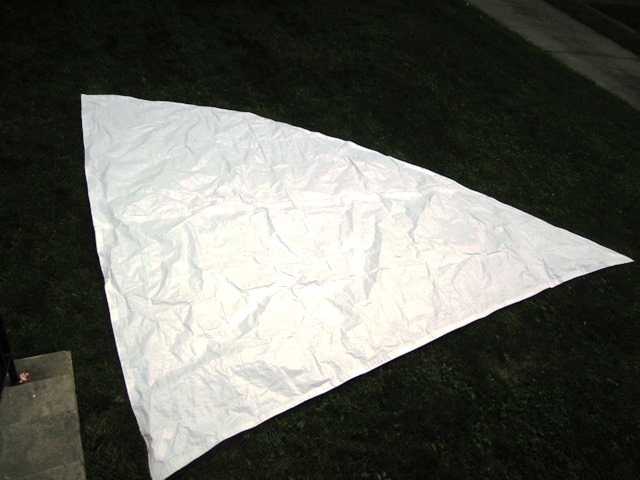 My darling wife has been putting finishing touches on the polytarp sail. The boat is almost ready to launch. 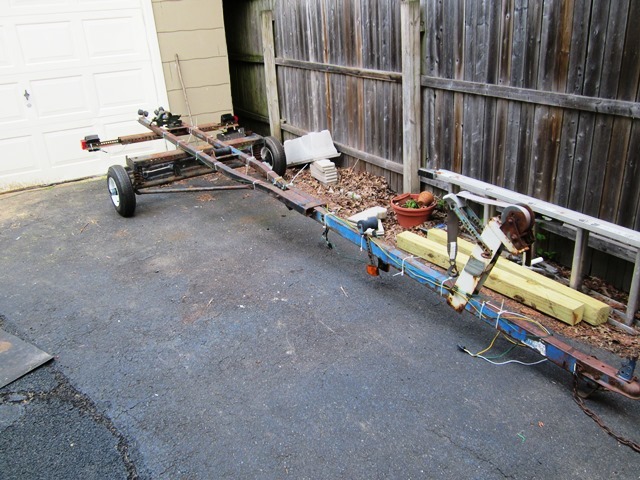 Remaining steps: add trailer bunks, install a hatch hold-down system; Trial fit sails to spars and spars to boat, haul it to the State Police to receive a Hull Identification Number, take the number to the Motor Vehicle Commission to register the boat. I recently took a day off and kayak-camped with my friend, Chris, at Round Valley Reservoir. 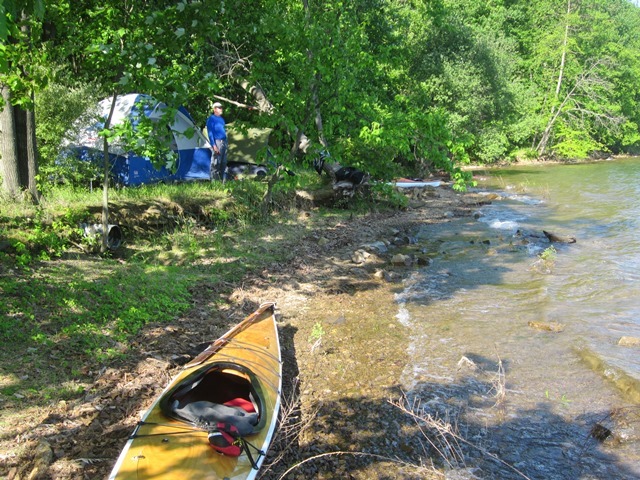 The outbound trip was the first one ever with camp gear in the boat, about 60 pounds. 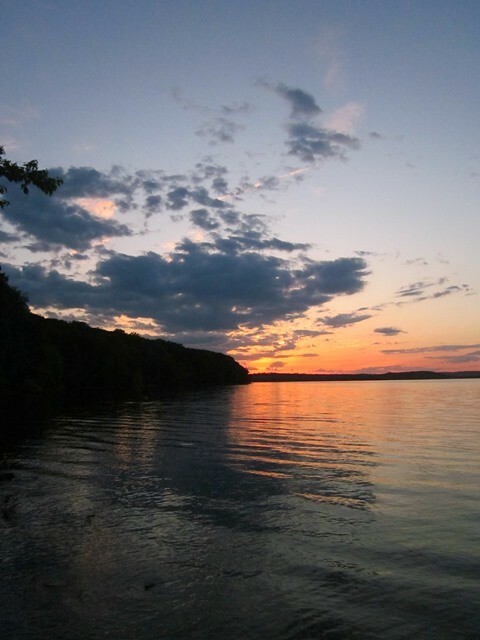 Initially, the boat misbehaved – redistributing the cargo resulted in a rock-solid ride to our campground 2-1/2 miles away. 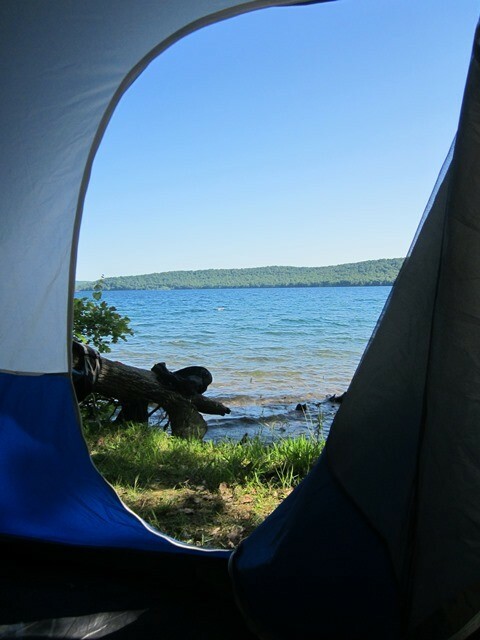 The next morning was beautiful – we lapped the eastern half of the lake, surfing downwind on the return to camp. Later, we returned to the car in Force 4+ headwinds with decks awash in whitecaps, a good ride. Shoreline view, Chris near his tent, his boat in the distance. Spent part of the weekend painting the boat . . . here are some pix. Primer and top coat are Rustoleum Marine. 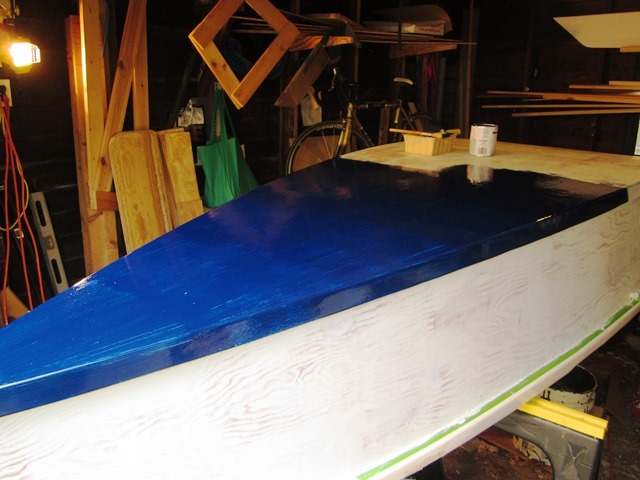 While primer isn’t fashionable, it was nice to see the boat in one color. Five minutes after painting began, a windy weather front came through and seemed to blow every airborne artifact on to the wet finish . . . Murphy must have been a boat builder. One coat of paint on . 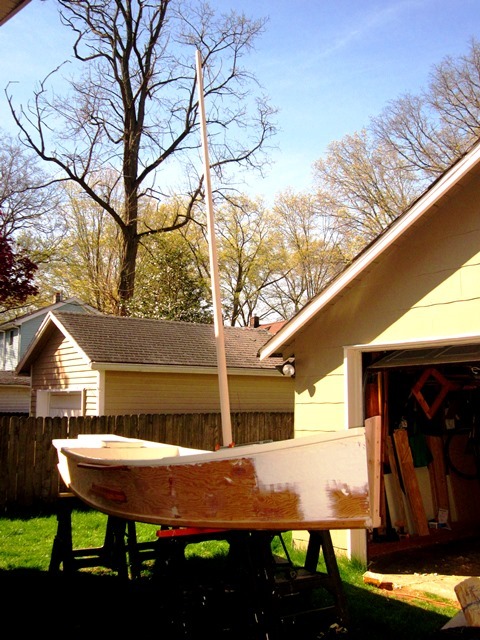 . .
After a cold and inactive winter, springtime boatbuilding has resumed. 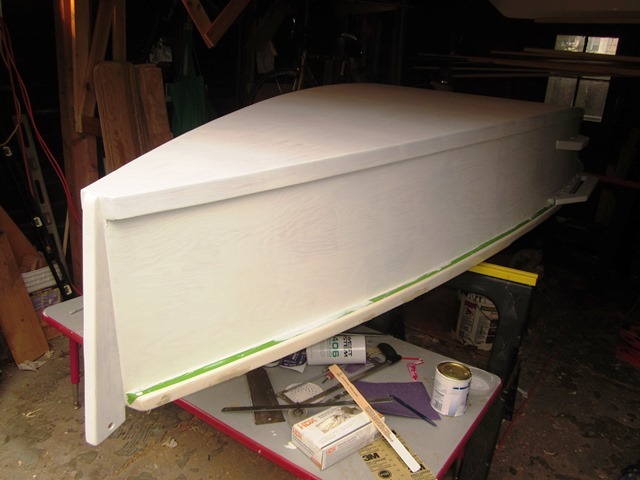 Every piece of the boat has been fabricated, except for the tiller (the stick for steering the boat), so we’re in assembly mode now, painting and sail finishing soon to follow. On Monday, the mast was mounted on the boat for the 1st time. Thanks to my entire family for helping to move it in and out of the shop. My apologies for not tending to the blog. Progress on the boat since the Autumn has been very slow, so there hasn’t been much to say. Remarks about mast-building and leeboard mounts will have to wait . . . for now. Work on the boat has gone in fits and starts. I’ve started on leeboard guards, and my sail is 3/4 complete. 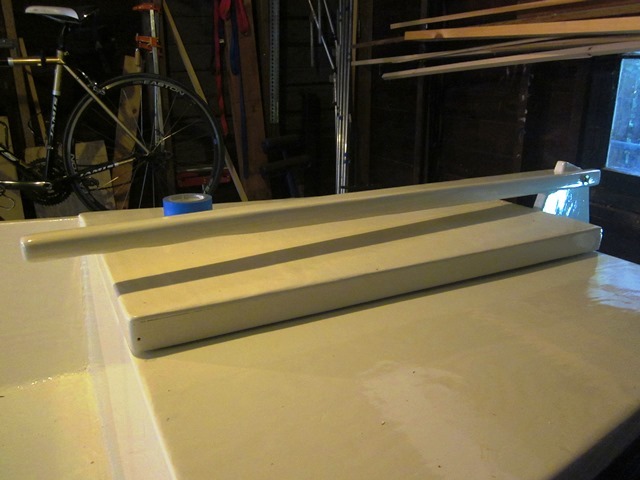 I even made a tapered mast blank during my vacation and have been reconditioning an old Holsclaw trailer. But all work and no play is limiting my progress and I doubt that the boat will make the water this year. 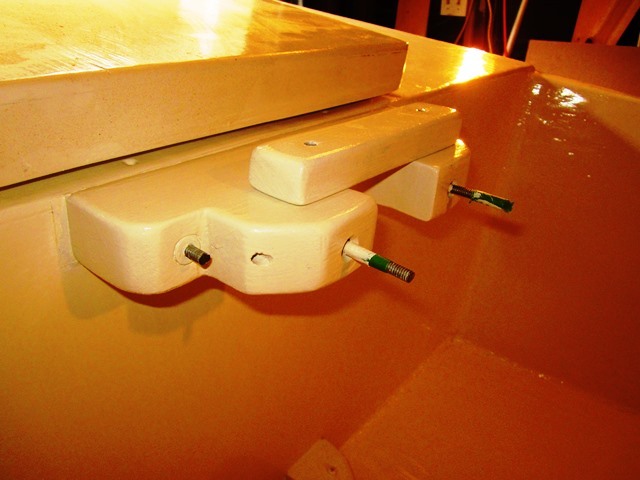 One thing that did go right … I cast a lead weight into the rudder. For the Mayfly, the rudder blade hangs free so that it will kick up when it strikes an object. However, the free wooden blade would float in the rush of passing water, so it needs several pounds of lead to keep the blade in place. 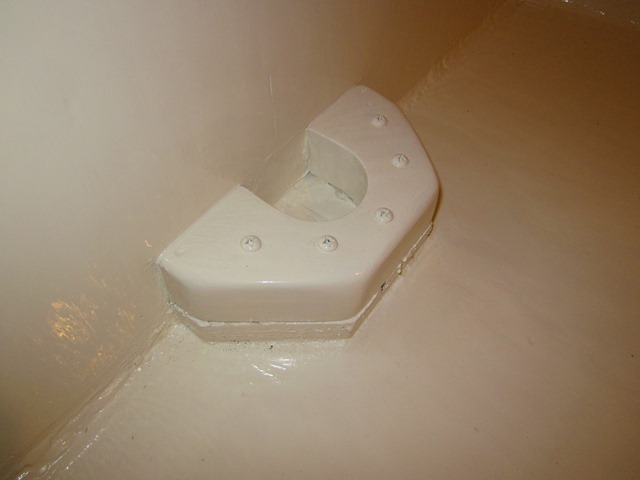 The cut rudder with a metal backing plate. 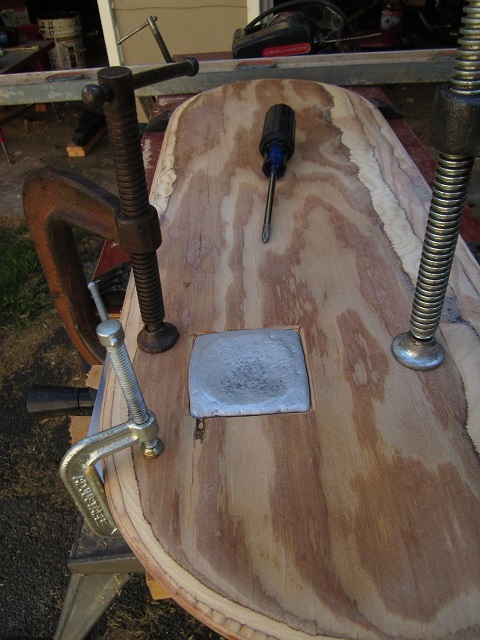 Bottom view of lumber and shims holding backing plate. Note the anchoring screws and chamfered edges. 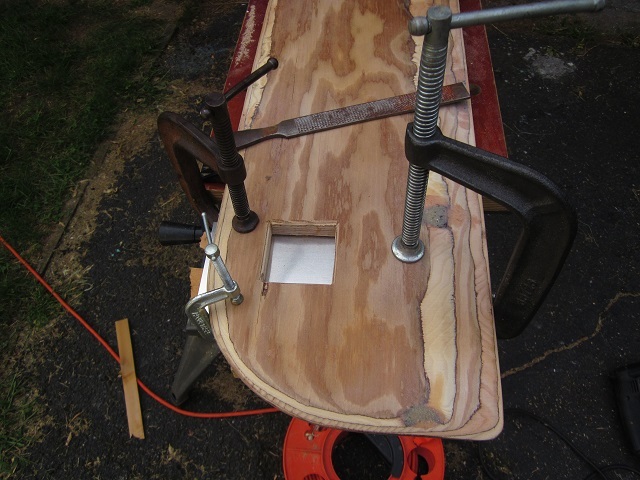 To prep the rudder, I drew in the lines for cutting a square hole, then drilled two corners with a 3/8-inch bit. I stuck a sabre saw through the holes and cut the edges, then used a rasp chamfer them. Theoretically, this would allow the molten lead to form a lip, which would hold the lead in place . 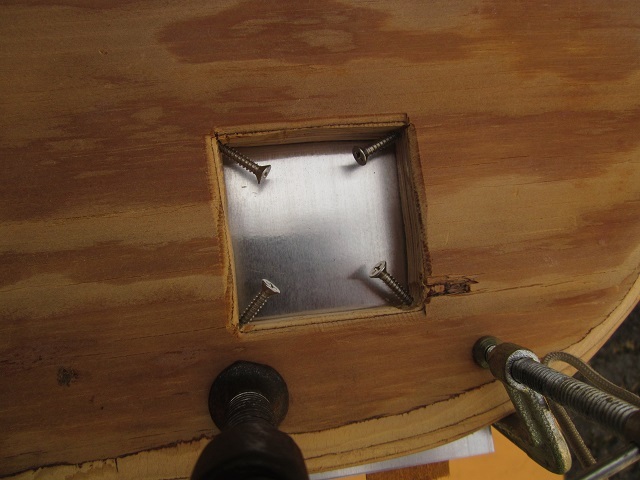 I also installed some 8 x 1 wood screws in the corners of the hole to anchor the lead in place. The big challenge was to source some lead. Three pounds plus were required, the amount prescribed for filling a square void 2 x 2.5 x 1 inch. I scoured Home Depot and the Wal-Mart fishing section for something big and cheap . . . No luck. I called a large marina with a reputation for casting lead keels . . . No callback. I did find 5 pounds of “lead wool” in the plumbing section of a large lumberyard, but the price tag encouraged me to look further. Finally, I did what Jim recommends in his book – I stopped by my mechanic, who handed me a 20-pound can of old wheel weights. Thanks to the good folks at Bill’s Ineffable Auto Rehabilitation, I was in business. Back home, I used a magnet to differentiate lead weights from ferrous metals, then pinched each with cutting pliers to confirm that they were soft lead. I then cleaned all the grease off with brake cleaner. I threw what I thought I needed in a coffee can, making sure that too was metallic – many newer ones are mylar-covered cardboard. 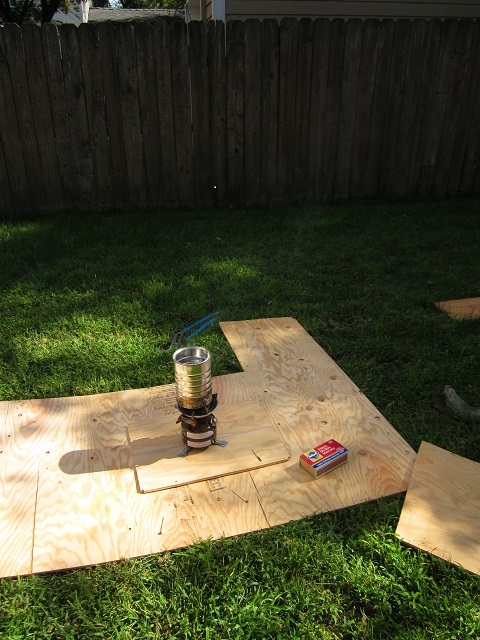 I broke out a single burner camp stove, fire extinguisher and a few other items to make a suitable makeshift foundry in my yard. A colossal set of pliers to grab the hot can, some safety goggles, and I was good to go. I let the weights dry in the sun while I made preparations. I did not want water anywhere near this operation for fear the molten lead would splatter or explode from steam expansion. 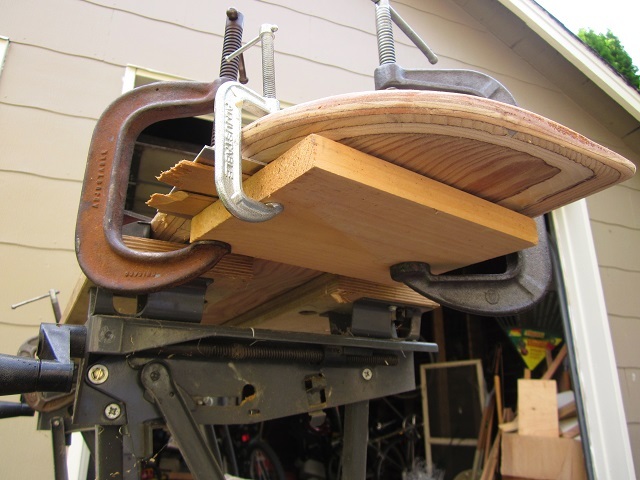 While they were drying, I clamped a fairly rigid piece of decorative metal to the underside of the rudder, backed it with a wood board and clamped it in place on a portable workbench. I had to shim one edge of the metal to match the faired curve of the rudder, lest molten lead escape thorough the gap. Time to fire it all up, I set the can on the Coleman burner. Half-throttle and 5 or 6 minutes were all that was needed. I stayed back avoid the smoke and fumes. When the lead had melted, I grabbed the can with the big pliers and whisked it to the rudder. The volume of molten metal was just enough to fill the void in my rudder, plus a bit for a meniscus, and it all solidified just as the pour finished. Luckily, the un-melted steel wheel clips stayed in the can. Couldn’t have planned it better. Note that I “planed” the casting with a Stanley Surform to flatten it flush with the rudder surface, pressing hard. This produced shavings that were easy to collect. Be advised, dry sanding this stuff would be a bad idea. I'm blogging my sailboat build to document the process, costs, and time for other amateur builders to see. I'm also showing friends what I'm up to. Out of the Shop . 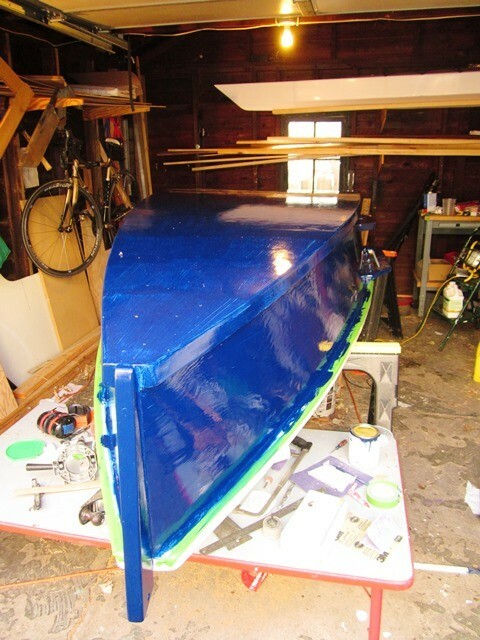 . .
Michalak Boat-Building Forum – On Yahoo!